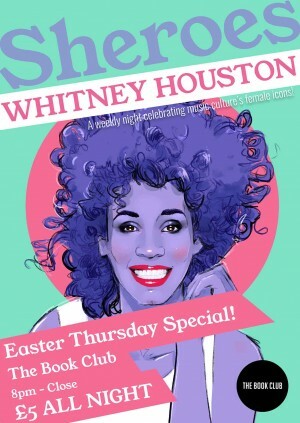 Join us this Easter Thursday as we celebrate Queen Whitney!! Singer, songwriter, actress, record producer…Whitney is a true artist and innovator who has trailblazed over music industry and contemporary culture for the last 30 years. Her evolution as an artist has intoxicated us across a phenomenally extensive body of art that seem to exude from every fibre of her being, spanning music, fashion and art and she is thus the perfect Sheroe for us to be celebrating. So… Every Woman, every man, if you Wanna Dance With Somebody then get them requests posted on the wall… It’s going to be So Emotional. Sheroes is a weekly event which celebrates female music and style icons that have created a lasting legacy in pop culture. Focusing on a different artist each month, a pool of resident DJs play a selection of their favourite tracks by the artist as well as selections that have influenced these DJ'S wider music collection. Come party your Thursday nights away with the best DJs in Shoreditch. £5 after 9pm / Free before 9pm!